Now, I don't know if you've ever watched this show but it is quickly catching the eye and interest of our little ones! Declan has watched this since it first came out as he actually started liking the Rabbids from their video game. These are goofy, trouble making bunnies who obnoxiously get into everything around town! We watch this show constantly in this house so I am thrilled to see them expanding the line of products available! 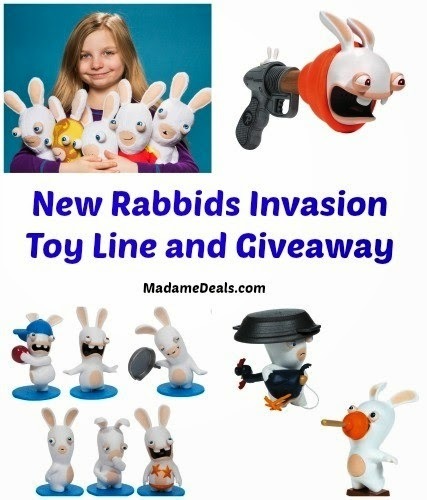 The Rabbids Invasion has begun and just in time for the Easter holiday you can deliver the Easter Bunny on a more funny note. These crazy rabbits are not just for Easter and will make great gifts anytime of the year. These funny friends have lept off the screen and into the hearts of children and adults alike and you have a chance to win a Rabbids Invasion Prize Pack below. Chicken Surprise – Pull the chicken head back and hear it cluck, then release to shoot egg and hear the Rabbids silly laugh! Plunger Face – Pull plunger back and hear a Rabbid noise, then release to smack the Rabbid in the face and hear it yell! The Driller – Spin this little guy by hand and listen to this Rabbid’s dizzying yells and screams! Starfish Friend – The Rabbid will speak when the starfish is pulled back. Then let it go and hear a …bwaaah!!! Rabbids – These iconic Rabbids are curious creatures that have invaded earth; we don’t know where they came from or how they got here, but we do know this-- they’re here to play! Bwaaah! Loco Libre Rabbid – Let’s get ready to Bwaaah! One of the mightiest wrestlers to ever walk the earth, Loco Libre Rabbid is ready to rumble and tumble his way into world supremacy! Super Bwaaah – Quicker than a speeding skateboard, stronger than a flushing toilet, and able to jump shopping carts with a single fart! It’s a cow? It’s a plunger? It’s Super Bwaaah!!! Rabbids Mini Figure Blind Bag-Create your army of Rabbids! Which wacky Rabbids figure will you get? Maybe the rare high value mystery Rabbids figure? The iconic collectible figures are fun to trade and swap with friends. Collect all 7 unique Rabbids figures. Each figure sold separately. MSRP: $2.99; Available at Walmart and Toys “R” Us. Remember you are entering on A Lucky Ladybug! Giveaway runs from 4/16 - 4/30/14 at 11:59 PM. The Winner will be chosen at random and has 48 to reply from winning email notification or a new winner will be drawn. I also like this one from the Wal-Mart site; Nickelodeon Rabbids Invasion Easter Rabbid Smirk Plush. I also like this one from the Toy's R Us site; Nickelodeon Rabbids Invasion Series One 2 inch Figure 6 Pack. 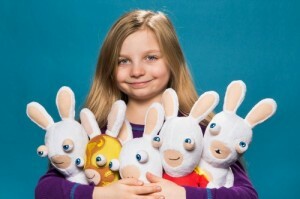 My son would love the Smiling Rabbids Plush! The Rabbids Plunger Sound Blaster looks very fun!